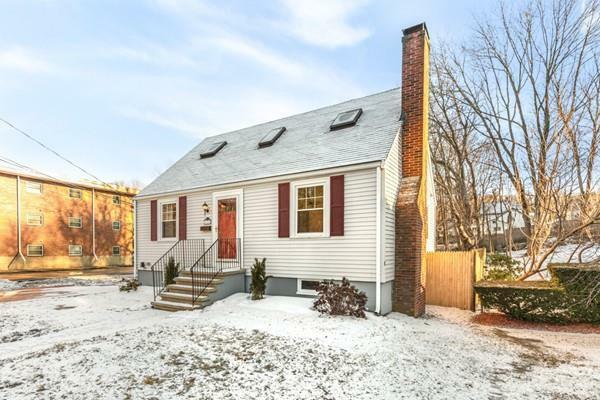 Prime Westside location for this beautifully renovated classic New England cape cod. Situated on quiet street with picture perfect fenced lot ready for a garden, family and your pets. A short distance to the commuter rail, downtown shops, restaurants and the popular Lake Quannipowitt. This pretty home has it all, beautiful new kitchen with granite, stainless steel, white cabinets opens to the dinning room for easy flow and entertaining. The property features gleaming hardwood and wide pine floors, new central ac/ heat, replacement windows and new bath. The cozy living room features a wood burning fireplace to keep you warm on cold winter nights as does the finished room in the lower level w/ tile planks perfect for a man cave or gaming room. This is a great opportunity for a buyer looking for a turn key property with nothing to do but move in unpack and enjoy years of maintenance free living in a wonderful community in a convenient location for commuting to Boston and the N.Shore.